Twice a week, Making A Mark gives an insanely talented artist some IADW brag-space. Today goes to Eddy Newell, the guy that rocked Black Lightning back in the mid 90's and has now turned his hand to stunning black and white shots of DC and Marvel's mystical and mighty. Sure there are pics of Batman and Superman as you flip through his purchasable portfolio, however they are a drop in the pool compared to the number of works based around more cult figures like the JSA, Cloak and Dagger or The Seven Soldiers of Victory, like Dr Strange and Deadman above show. That just makes it even better - these characters need more exposure! 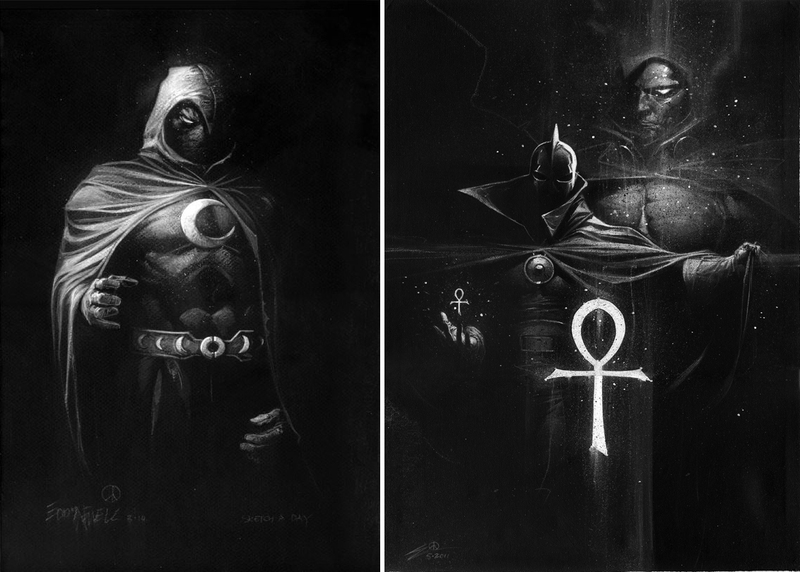 Eddy's black and white brilliance not only brings a sombre tone to the likes of Dr Fate, it seems to mix the best of styles from painters Jim Dine and Dave McKean, plus illustrating legends like artist Bill Sienkiewicz, right there on the page. Who needs colour anyway? These ghostly images look like panel's right out of Arkham Asylum! 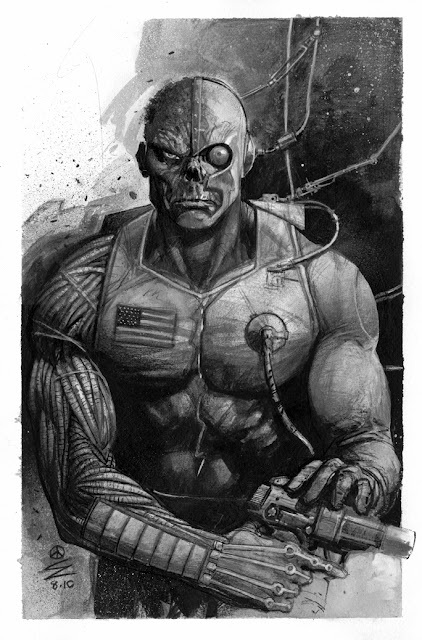 Outside of Darkhawk, Deathlok is my most missed property at Marvel right now, and this awesome image just makes the cravings worse. Any kind of a world where a Frankenstein cyborg can be left gathering dust is no world for Captain America to be bothered saving! For more of Newell's work or to buy a piece for yourself, visit his online gallery after the jump. Newell's Black Lightning was some great stuff! It's a shame that DC trashed the garb Newell gave Jefferson Pierce before this relaunch. At least there was an action figure made with that outfit. I've seen Newell around at different cons, but haven't made the time to visit with him. Thanks for finding this and sharing with us, Dan! 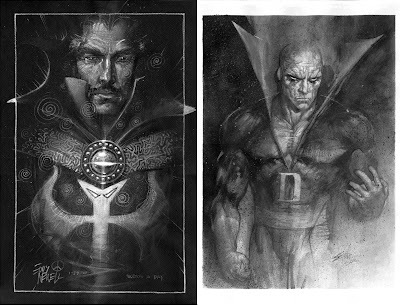 There are some characters for whom B&W just works, Strange, Deadman & Fate most of all. Batman Black & White was also cool as hell. I have that figure to Doug! One of the few I do, but he's back in storage in New Zealand somewhere. Glad you liked the post. What character that wasn't in his library would you like to see in B&W Pensol? I'm thinking Black Adam or Gorilla Grodd! Black Adam would be OK in B&W, but the medium seems to work best with the old-skool proto-Dark Knights such as The Shadow or The Green Hornet. Rocketeer as well, come to that. Nice picks Pensol - I guess that's why the JSA works so well. Maybe he could even dust off The Phantom? The Phantom - now I'd LOVE to see that! In fact some sort of gritty Noir Elseworlds set in the 1930s involving The Shadow, The Phantom and this new kid on the block in Gotham would be most interesting if done well.